ORDER ONLINE TODAY! Simply click on the link below! Welcome to Boulder Junction Wood Grill! Welcome to Boulder Junction Wood Grill! 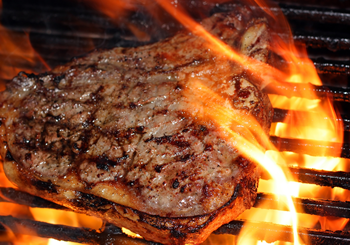 Refresh your senses and experience the most unique Charcoal Grill Steakhouse in the greater Milwaukee area. Boulder Junction is famous for more than just hamburgers and steaks coupled with outstanding service - It is a dining adventure. Dine Mountain Side while a cascading waterfall gently flows into a shallow pond, as Mountain Wildlife look on. The menu offers a variety of sandwiches, steaks, chops, seafood and salads sure to please every appetite. Visit us every Wednesday for Trivia Night from 7-9pm. Weekly prizes and cash! 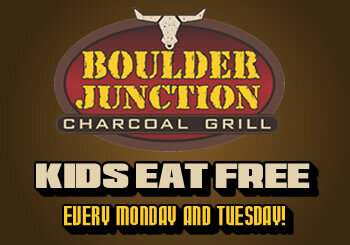 KIDS EAT FREE every Monday and Tuesday.! 1 FREE kids meal with the purchase of an adult meal. Beverages not included. 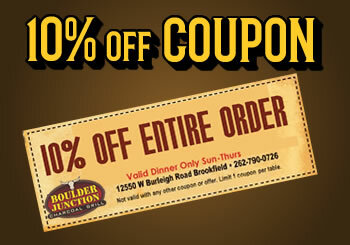 Boulder Junction Charcoal Grill is now serving 100% Black Angus Beef and Icelandic Cod Friday Fish Fry. The food is remarkable; good quality, well prepared and well presented. Not only is the food great, but the staff are a wonderful bunch of people ready to serve you as you walk in the door. Sun. – Thurs. 11:00 a.m. – 9:00 p.m.
Fri. – Sat. 11:00 a.m. – 10:00 p.m.
Sun. – Wed. 11:00 am. – 11:00 p.m.
Thurs. – Sat. 11:00 a.m. – 2:30 a.m.